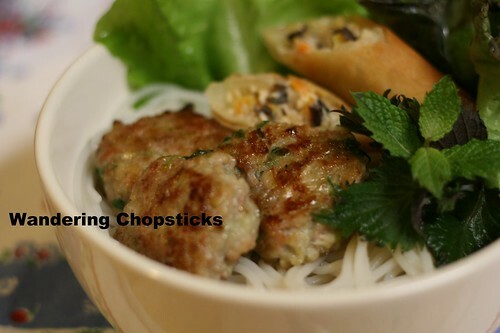 Now that you've made Nem Nuong Hanh La (Vietnamese Grilled Pork Patties with Scallions), let's assemble it all together into a Vietnamese restaurant favorite -- bun (Vietnamese rice vermicelli noodle bowl). 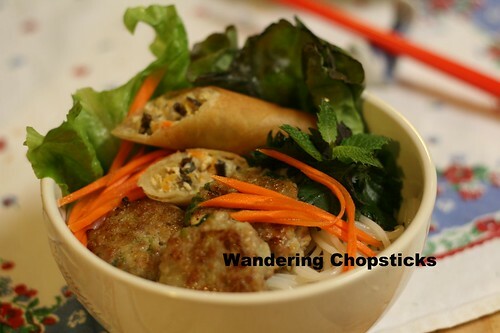 Pictured is the nem nuong hanh la with Cha Gio Chay (Vietnamese Vegetarian Egg/Spring Rolls), but it can be any kind of egg rolls you wish, or none at all. 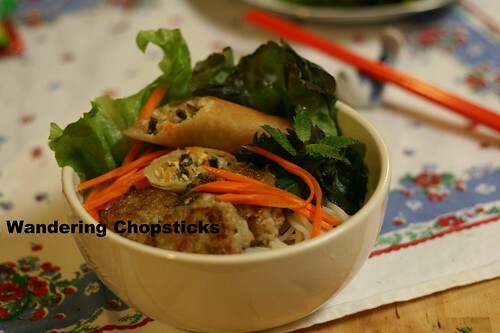 Add some vegetables and herbs, and douse everything with Nuoc Mam Cham (Vietnamese Fish Dipping Sauce) and you've got a complete meal in one bowl. This is really more of an assembly list than a recipe. Add more noodles or meat if you want a heartier meal. Add more lettuce or herbs if you want it to be more of a salad during hot summer months. You can also lay out the components separately and have each person assemble his or her own bowl. 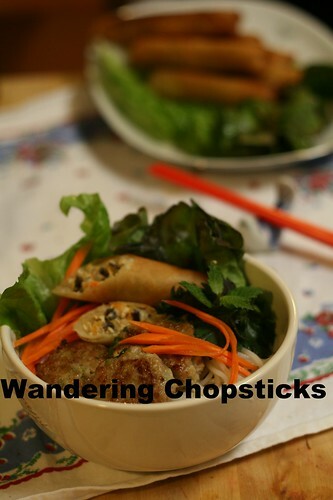 Vietnamese herbs such as rau ram (Vietnamese coriander) or tia to (Vietnamese perilla), and mint, cilantro, etc. Boil and drain the noodles. Pluck and wash the herbs and lettuce. Make the meats, egg rolls, and fish dipping sauce. To assemble, place as much noodles as you'd like in a bowl. Add the greens, meats, and egg rolls. Pour as much dressing over everything. Hmm. This bowl lacks a little color. Some julienned carrots livened the bowl. 1 year ago today, Dong Nguyen Restaurant - Alhambra. 2 years ago today, Petroglyph Point Trail - Mesa Verde National Park - Colorado. 3 years ago today, an American classic, the BLT (Bacon, Lettuce, and Tomato) Sandwich. 4 years ago today, Sinh To Nha Dam (Vietnamese Aloe Vera Shake).